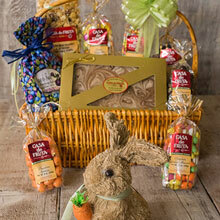 Casa de Fruta | Big Bunny Easter Basket 106 oz. A charming gift basket hand-packed with a special selection of creamy mint balls, fudge, crunchy caramel corn, irresistible chocolate pieces, and much more! Easter Select Mix 12 oz. Chocolate Pastel Apricots 8 oz. Chocolate Jordan Almonds 12 oz. Wild Blueberry Muffin Mix 16 oz. Chocolate Vanilla Swirl Fudge 16 oz. Dark Chocolate Sea Salt Caramels 8 oz. Net Wt. 106 oz. Ship Wt. 10 lbs.